According to the locals, the village is so called because, the local Goddess Harshat Mata is shown portrayed in a joyous mood and spreads brightness or abha all around. The village's original name was Abha Nagri, and its name today is Abhaneri. The village is said to have been founded by the legendary king Raja Chand and thus the village could be over three thousand years old. However, it is felt that the mythological Raja Chand could be King Bhoja, who ruled over the Gurjar kingdom in the ninth century AD. The ruins of the temple conform to 10th century architectural and sculptural styes. The Harshat Mata temple dates back to the tenth century CE and is placed under the protection of the Archeological Department of the Government of India. Daily worship is offered to the deity in the temple. The temple is in ruins and pieces of sculpture showing a fine degree of craftmanship lie strewn around. 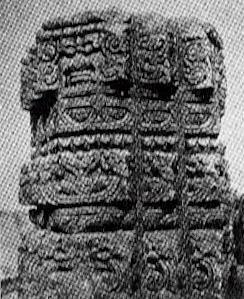 The image above is that of a carved pillar in the temple.An annual fair held in honor of Harshat Mata lasts three days and numerous devotees and merchants gather from neighboring villages.